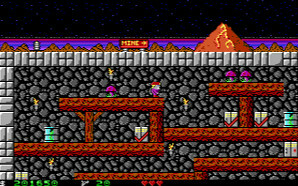 Ignoring everything I had said in the previous posts in this series about Commander Keen being next (stupid rat things still kill me…), I have instead worked my way though Crystal Caves. 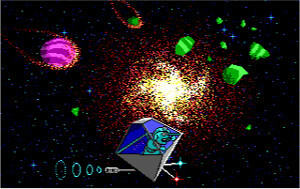 Like many other Apogee software games, this came in three episodes – Trouble with Twibbles, Slugging it Out and Mylo Versus the Supernova – with the first game being free and the other two requiring a purchase. An interesting fact I found out about these games was that a patch was released for the original game 14 years and one day after its original release, fixing a bug when run on Windows XP. That is what I call support! Meet our hero, Milo Steamwitz. He knows exactly how he is going to make his fortune, but needs to generate some money to invest first. So it is off to some remote planet where large crystals are just lying about in caves waiting to be harvested. You start off in some sort mine shaft that provides access to 16 caves to be explored. In each cave you have to run around, jumping between platforms, flicking switches on and collecting all the crystals while avoiding various obstacles and shooting aliens. Each cave has a bit of a theme to it, with some having continuously falling rocks to avoid and others having “low gravity” (which does not let you jump higher, but does mean you get forced back whenever you shoot – interesting…). Once all the crystals are collected, the exit door unlocks. I had played the first episode many times when I was younger so I zoomed through to the end quite quickly. 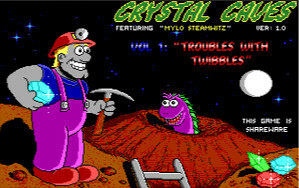 For each level there is a key that you can collect which allows you to open all the treasure chests scattered throughout the level, but having no siblings around to eliminate from the high-score board, my motivation to do so was limited… At the end of the first episode, Milo sells up his collected crystals and invests in a Twibble farm. It turns out that Twibbles are prolific at eating and breeding so the planets resources are soon used up. Also, no-one wants to buy Twibbles any more, so I guess he just abandoned them all to die of starvation. The second and third episodes are very similar to the first. I think there is a slight difficulty increase, but it is hard to judge given how much I had played the first episode previously. The difference I did notice was that a lot of levels required you to do the crystal collecting for different sections in a defined order. There were many places where the only way to go back to collect a crystal you missed was to die and restart the level. 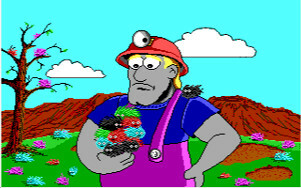 What is worse, there is a bug in the third game where in the mine shaft there is an area where you can not escape (pictured). So the two levels there must be left until last, otherwise you have to restart the game. The final episode see Milo giving up on farming. Instead he wants to buy a solar system to set up a vacation resort based on some perfectly legitimate sounding scheme he saw on TV. Sure enough, once he signs the contract, the whole solar system gets destroyed in a supernova (I bet you could have never guessed that would happen from the game title…). Luckily, the supernova left a nice looking backdrop for a space burger joint. It is now quite popular and Milo can sell his burgers at a price that looks expensive even accounting for inflation. I was slightly disappointed at the lack of additional game-play elements in the second and third episodes. The two episodes I had not previously played were entertaining enough, but that is influenced by nostalgia. Overall, I think these games are worth playing, but if you finish the free episode and are not impressed, do not think things will improve. So… will I finish Commander Keen: Vorticons for the next post? Not likely… But I am running out of ideas for old DOS games to play, so make me some suggestions. I can recommend Secret Agent, it uses the same engine as Crystal Caves. +1 for Bio Menace! Can’t believe many people haven’t played or even heard of this gem from Apogee.. I can’t recommend this game enough. Actually I would +1 all your recommendations, have played every one of those games and loved them. Too bad they just don’t make games like them anymore.. these days it’s all about the graphics, graphics, 3D, DRM, online stuff, and did I mention graphics? Also, I’m surprised you missed out on Dangerous Dave! Who can forget the classic by John Romero that started it all? (and then he went on to develop Wolf3D, Doom and Quake which totally changed the PC gaming industry..). Speaking of Dave, I’m ashamed to say that I still haven’t clocked it, despite playing it for the past two decades – that level 7 is a killer. Back in the 90’s I dearly loved The Elder Scrolls: Arena. It’s a DOS FPS. Now that they’ve progressed the series to Skyrim I went looking for Arena and found that they’ve now released it for free! Not only that, they offer tips on making it work in DOSBox. I recently played through the whole game, and it’s just as much fun now as it was then. Third for secret agent and second for Cosmo’s Cosmic Adventure. The only other game I remember playing as much was interplay’s Castles (an extremely fun castle building sim complete with RPGish story, wars between Celts or ogres, and decent music).